Fast and efficient line (Ticket order then pay then food). Signage and extra tables were a little unclear however. Part of the efficiency was the use of all styrofoam take-out containers for both dine-in and carry-out. Excellent Cod and sides (slaw and beans). Good dessert choices with a wide selection. Although overall choices were limited, the food was well done. Cheese pizza for children's menu. Children's menu was limited, but the fish sandwich was more than enough to share. The tale of two pieces of Cod. One piece was excellent - crispy on the outside and tender and moist on the inside. The second piece was a dud. I think it was an outlier, a bad piece of Cod in the batch. Very good sides, and different from the standard fish fry fare. The seasoned parmesan chips were to die for. You could eat them all night. Spiced apple slices and cole slaw were also outstanding. Good variety of homemade desserts. Fish tacos were a new feature since we last visited, and they were excellent (according to my wife). Very good Cod. I had the fish tacos which were who Cod fillets in a taco. Delicious! $8 for adult plate with dessert. But only water and coffee included. However, two pieces of cod were big. Very good value. (An increase in the perception of value since last time we came.) About $30 for our family of 5. Cod dinner was still $8. Good selection of price points. Fish tacos with one side was only $6. Fish and chips were $5. Kids meals were $4. All included dessert. Beer/wine $2. Drafts of Schlafly were $3. Cod dinner up to $10 a plate, but good options for price levels. Fish and chips (one piece of Cod) and lots of parmesan chips was only $6. Kids pizza was $2 a slice. Plus many more options. So if you have finicky kid eaters, this is a good place with lots of options. Dinners include drink and dessert. Gym created a buzz, although a little too cafeteria like. Large crowd both eating and in line. 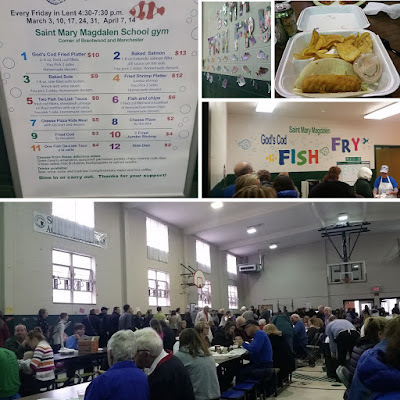 A great atmosphere of a fish fry. Even with the long line, there is a good din of conversation in the high ceiling gym. Volunteers friendly and passionate with their 'God's Cod' branding. Even though it can get crowded, there is always space available to sit. Only downside, is that some of the seating is bench style cafeteria tables. 3 out of 4. Limited menu, but it was done right with great tasting fish and quick lines. Our first visit since 2007, and the week after they were voted Fan Favorite Fish Fry in the 2013 poll. It's easy to see why they were voted #1 this year. Good food, good atmosphere, and a good value. Everything a good fish fry should be. Some creative sides you don't always see at other fish fries. The only downside, is that they are somewhat a victim of their own success (the crowds can make finding a parking spot tough). I like their branding and the pride they take in their signage. 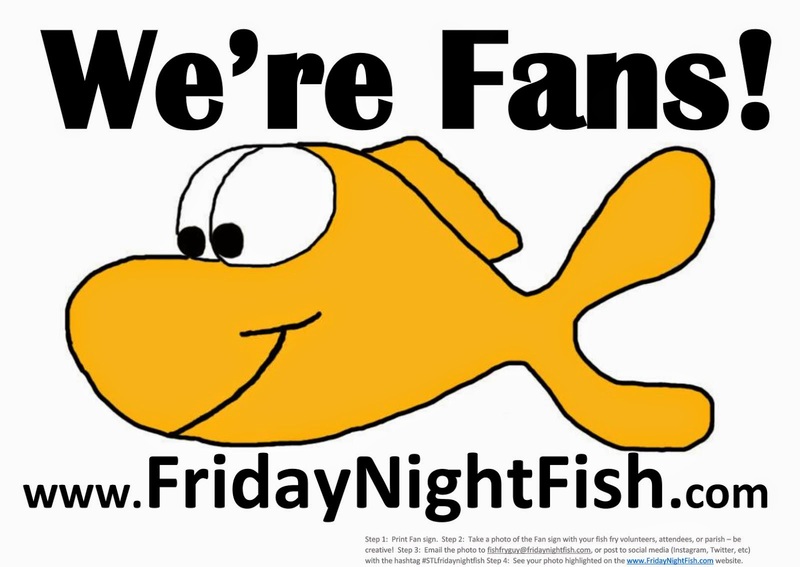 It was fun to see the signs telling people to vote in the Friday Night Fish Fan Poll. Drafts of Schlafly is always a nice touch. Overall rating, I would move it up to a 3.5 out of 4 now. My comment from 2007 was a limited menu, but that is definitely not the case now. The addition of fish tacos, the great sides (the parmesan chips were a big highlight), and the increased realization of the value have all moved the rating up. 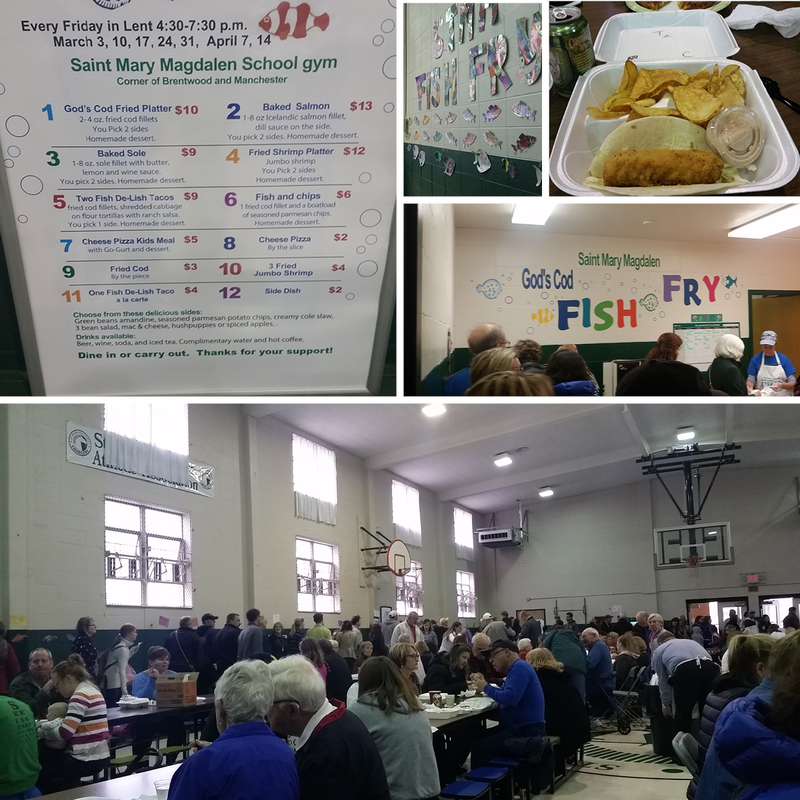 Great fish fry on multiple levels. Good Cod, good wayfinding, and festive atmosphere. Last time we went they had drafts of Shafly's. No drafts, but a good selection of canned microbrews. Highlight is the fish tacos. They take a whole fried Cod fillet and put it in a taco. The parmesan chips are another highlight - they are outstanding! Only downside is everything (even eating in) is styrofoam takeout containers. Signs telling folks to vote at Friday Night Fish! Some great signs and branding! The shrimp is excellent. Plenty of shrimp and a good size. well-worth the $10.00!! Fantastic fish taco with mango salsa! Easy to find and great atmosphere! Front bar greeted me with cold beer and wine for sale. Line moves fast with big portions. Fried cod best in town. Jumbo fried shrimp delish. Salmon served with cucumber dill sauce. Parmesan chips really good and new this year. 2 Thumbs up. We've been twice and have tried the shrimp and cod. The shrimp was outstanding and the cod was some of the best I've had. Had the parm. chips and apples. Both yummy! Large portions and good prices. Great selection of beer! Their baked salmon is d-lish-us!! Great food all around. OMG! This is the only place I eat fish. 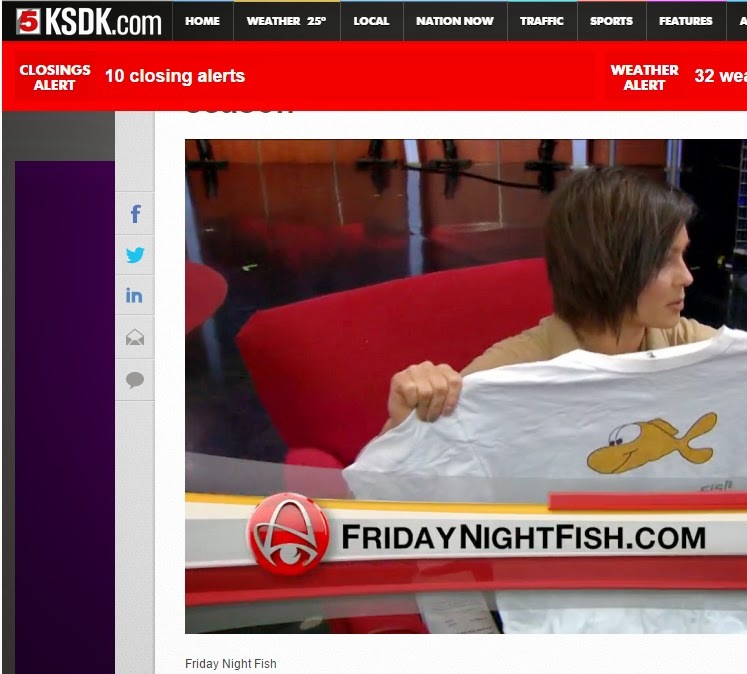 I LOVE the shrimp and it is greta to see the teamwork that makes this move so well. Even the kids get involved. Great parish.Very Well done! I've heard they have a drive-thru? Is this correct? It isn't mentioned anywhere in the article. They maybe have a drive thru. We don't check every detail - especially things we aren't typically interested in - like a drive-thru. Check their website or bulletin for more info! Good luck!